Joint pain, swelling, redness and stiffness are symptoms that may indicate the presence of rheumatic ailments. Disease recognition requires a professional diagnosis. We encourage you to get to know the scope of the tests that are recommended at various stages of diagnosing diseases associated with joints. In the catalog of tests, which help determine the cause of the ailment and the stage of the disease, there are both laboratory tests and imaging. To diagnose the patient, the doctor may prescribe a basic diagnostic tests or specialist examination, enabling the identification of specific rheumatic diseases. Execution of individual tests will help to determine the presence of a rheumatic disease or assess the stage of the disease. In a situation where we see the first signs of arthritis or other ailments associated with it, the doctor may recommend a specific package of tests. Erythrocyte sedimentation rate test is standard preventive screening. The pH of the ESR shows the erythrocyte sedimentation rate in time. The increased rate of ESR indicates the occurrence of inflammation (infectious or non-infectious) in the body. A high rate of ESR that is above normal may indicate the presence of health problems including rheumatic disease, autoimmune disease, hypercholesterolemia, hypothyroidism or hyperthyroidism or other medical conditions. In patients suffering from rheumatic diseases, there is rapid descent of red blood cells, which results from the overproduction of autoantibodies (a phenomenon characteristic for most autoimmune diseases). An ESR result in patients suffering from rheumatoid arthritis can even be a three-digit number. When performing the morphology test, the hemoglobin (HGB) level is often assessed as well. A symptom often occurring in people suffering from rheumatic diseases is anemia. It is an important study, which should be done at the stage of diagnosis of a rheumatoid disease. Statistically, this factor is detected in approximately 70-90% of patients with rheumatoid arthritis. However, its presence does not explicitly acknowledge nor exclude the presence of RA. The increased value of RF can occur both in rheumatoid arthritis and other diseases, for example cancer, discoid lupus erythematosus, muscular inflammation, muscular and cutaneous inflammation, tuberculosis, viral infection or liver disease. Diagnosing the rheumatoid factor, one should be aware of the existence of a relatively large amount of results with an enhanced level that are not confirmed in the diagnosis of rheumatoid diseases. The probability of the occurrence of elevated levels of the rheumatoid factor is increased in the elderly. Therefore, it is necessary to compare the RF test results together with the results of other tests, among others, ESR, CRP, as well as the clinical course of disease in a patient. The CRP abbreviation is an acute-phase protein (C-reactive protein). It is a test that is performed in order to determine the concentration of C-reactive protein, which informs about the occurrence of inflammation in the body. The execution of a CRP test in the case of diagnosis of autoimmune diseases, cancer, and the presence of various kinds of infections is recommended. Analytical examination of uric acid allows for the diagnosis of gout and is used to monitor the course of therapy. Excessive concentration of uric acid can cause pain. The Waaler-Rose test is important at the stage of diagnosis of the rheumatoid factor. A positive test result indicates the presence of a rheumatoid factor in the patient's blood. Did you know by that using only Hyalutidin HC Aktiv you are supplying the main building components, that is hyaluronic acid and chondroitin sulphate in a dose of 15000mg? An increased titer of anti-CCP occurs almost exclusively in patients with RA and can be detected in the early stages of the disease. The material to be tested is blood taken from the patient. The test is performed to determine whether the patient has recently had an infection caused by group A streptococcus. Streptolysin O is a substance immunogenic, which means that it can cause excessive production of antibodies that will negatively affect the immune system. Infection of a certain group of streptococcus microorganisms can cause rheumatic diseases. The tests should be repeated regularly in the case of long-term occurrence of inflammation in the body, which may indicate the progression or development of the next stages of joint damage. The results of ultrasound can indicate the presence of erosions much earlier than is visible at the performance of an X-ray examination. blood flow in the synovium. Symptoms such as swollen or thickened synovium and other soft tissues (tendons, muscles, ligaments) can confirm the presence of rheumatoid diseases. Ultrasound is a widely available diagnostic method. Unfortunately, the test does not allow to establish the state of the inside of the bone, nor does it allow clear confirmation of the rheumatoid arthritis disease. Magnetic resonance imaging allows very accurate imaging of the status of soft tissues and bones. Resonance analyzers with high accuracy distinguish between bone tissue and soft tissue, which can significantly help in the diagnosis of study of the advancement of the rheumatoid disease. Magnetic resonance imaging shows symptoms such as inflammatory infiltrates of the marrow and the changes that occur in the synovium. Based on the obtained results, we are able to give a fairly accurate diagnosis. Unfortunately, due to the high costs of tests and low availability, MRI is not a test commonly prescribed by the physicians. Did you know that long-term use of different pharmaceuticals can adversely affect other organs and weaken the body? Choose a safe preparation like Hyalutidin HC Aktiv, which has natural components only. The first rheumatism ailments, such as muscle and joint pain and accompanying redness and swelling are an important signal, which cannot be underestimated. Limited mobility and efficiency of arthritis can over time advance quickly. Let's remember that rheumatic diseases affect not only the elderly. Intensive rheumatism affect people at the age of 35 - 40. 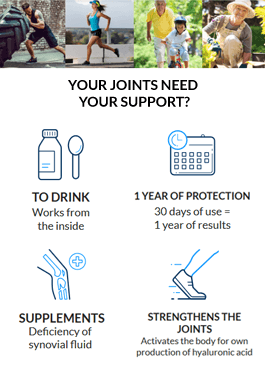 In the case of joint problems, it is worth to use an effective supplement rebuilding the structure of the joint and improving its efficiency. Let's remember, however, that professional diagnosis will allow us to accurately determine the cause of the symptoms and the stage of development of the disease. Early diagnosis in detecting rheumatic diseases can significantly increase the effectiveness of subsequent treatment.